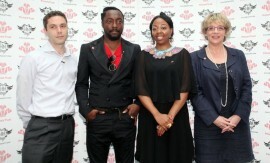 will.i.am has helped to TRANS4M the lives of underserved youth in the UK through a £500,000 donation to the Prince’s Trust to fund STEAM programs. The Prince’s Trust was founded in 1976 by Charles, Prince of Wales. Having completed his duty in the Royal Navy, Prince Charles became dedicated to improving the lives of disadvantaged young people in the UK, and began The Trust to deliver on that commitment. The Prince’s Trust has become the UK’s leading youth charity, offering a range of opportunities including training, personal development, business startup support, and mentorship.